Looks like they've finally gotten some long awaited $$$ for Fitchburg line upgrades. What do you mean, it has too many stops? Do you mean near Waltham, where there's only one line of track? concordgirl wrote: What do you mean, it has too many stops? Do you mean near Waltham, where there's only one line of track? I would say the poor souls on the southisde Worcester line have it worse with CSX. Amen. I am with you on that one. Removing stops in either Belmont or Waltham is a very bad idea. I hope this is not still part of the plan. The current stops are exactly where they belong -- a major university (Brandeis), two significant commercial town centers (Waltham and Belmont), and another densely populated commercial district (Waverley). As it happens, all levity aside, I agree just from having seen day in and day out how many people get on and off there. All of the Waltham area is densely populated, pretty much. Fitchburg Route is the longest on the system, currently, at just about 50 miles. I think the current problem is that the political forces on the Hill have been pushing successfully to provide frequent service the entire length of the route, forcing what should be South Acton local turns to become Fitchburg turns that have to make ALL the stops that should logically be on the shorter South Acton trips. Someone needs to smarten up and figure out that it's very unlikely that a train that stops at Hastings will pick up a passenger destined for North Leominster. They should split the schedule between South Acton and Fitchburg trips, limiting the local stops inside Zone 5 to South Acton turns as much as possible, and omitting them as much as possible on the Fitchburg trips. Double track between South Acton and the Willows would help. BTW, Guilford (now Pan Am Railways) does not maintain any of the route. It's all owned and maintained by the MBTA. The T upgraded the stick rail west of the Willows themselves. Only role Pan Am plays is that they dispatch out of North Billerica the portion of the route from the Willows to Fitchburg. Ooh. I live in zone 5. There just aren't South Acton trains at the convenient times. I would be really screwed if they did not stop at my station, and so would about fifty other people. Did you mean just split the route in half, or run fewer trains to certain stops? Ron Newman wrote: Removing stops in either Belmont or Waltham is a very bad idea. I hope this is not still part of the plan. The current stops are exactly where they belong -- a major university (Brandeis), two significant commercial town centers (Waltham and Belmont), and another densely populated commercial district (Waverley). They want to do the same in Ayer and Shirley. They want to make a central station with parking. That's crazy since the Ayer Station stops right in the center of town. I do not like this trend of moving stations to places you need to drive to! cpf354 wrote: Fitchburg Route is the longest on the system, currently, at just about 50 miles. I think the current problem is that the political forces on the Hill have been pushing successfully to provide frequent service the entire length of the route, forcing what should be South Acton local turns to become Fitchburg turns that have to make ALL the stops that should logically be on the shorter South Acton trips. Someone needs to smarten up and figure out that it's very unlikely that a train that stops at Hastings will pick up a passenger destined for North Leominster. They should split the schedule between South Acton and Fitchburg trips, limiting the local stops inside Zone 5 to South Acton turns as much as possible, and omitting them as much as possible on the Fitchburg trips. Double track between South Acton and the Willows would help. Yes, it's a bad idea...but this is what they call "progress".....i don't think backwards thinking is progress!! Last edited by LCJ on Sat Apr 26, 2008 4:17 pm, edited 2 times in total. Absolutely. 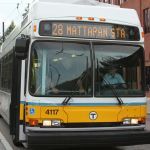 Additionally, all four are bus connection points, with Waltham being a major transfer point to a half-dozen routes. The station closing plan that was tossed out involved Belmont and Waverly, consolidating them at one stop halfway between. That might offer the potential of more parking if they take the now-vacant Belmont Springs property and build a lot there, but as Mr. Newman notes it would move the stations out of two busy commercial districts. My guess is that the town of Belmont won't let that happen.